LeConte Memorial Lodge, Yosemite NP, 1985. LeConte Memorial Lodge is a small Tudor revival building at the base of the cliffs in Yosemite Valley. The plan of the building is a "Y" shape. The main portion of the building is rectangular in plan. Two small wings, each 8'x12', radiate out from the main section at 45 degree angles from the northeast and northwest corners. A small concrete porch at the entrance to the building fills in the space at the top of the "Y"--the area between the two wings and the main section of the building. The porch is hexagonal in plan and is bordered by two stone walls that extend out from the gable end walls of the wings. The parapet walls and the low stone walls bordering the porch are finished with concrete caps. The building is constructed of rough-cut granite laid in cement mortar in a roughly coursed ashlar pattern. The foundation is stone. The roof of the main section is predominantly a gable roof, hut formed into a three-sided hip on the front elevation emphasizing the entrance to the symmetrical building. The two wings flanking the entrance have gable roofs, well-defined at the gable ends by tall parapet walls. The roofs of the wings are considerably lower than that of the main section. All roofs have broken pitches at the eaves and are finished with wood shingles. The interior of the building is divided into the central meeting room with a small room in each of the two wings. The upper level of the meeting room takes up the largest space. The lower level, several steps down, forms an inviting nook in front and to the sides of the fireplace. The massive fireplace is centered on the south wall, opposite the entrance. Benches and bookshelves flank both sides of the fireplace. The two small rooms to the northeast and northwest of the central meeting room are used for storage and office space. All floors are concrete. The interior of this building has a highly unusual exposed roof structure of hammer beams supporting scissors trusses. The hammer beams rest on engaged stone piers built into the walls. The roof is the dominant architectural feature on both the interior and exterior. The steep pitches and shapes of the roofs, and the parapet walls all emphasize the extreme verticality of the structure. On the interior the verticality is reinforced by the exposed roof structure and the chimney that extends from the fireplace to the roof. The casement windows throughout the structure are wood frame with original brass hardware. Windows in the main room are nine-light, paired casements with three-light transoms above. Small windows in the parapet walls have shutters, with half moons sawn into them to allow in some daylight. The centered entrance door is wood and shaped to fit the Tudor arch in the stonework. The door is flanked by nine-light casement windows. The building was first constructed during the summer and fall of 1903 at the base of Glacier Point, adjacent to Camp Curry. Approximately fifteen years later Mother Curry, proprietress of Camp Curry, approached the Sierra Club about the possibility of moving the structure at her own expense so that she could expand her camp operation. She proudly provided reasonably priced tent frame cabins for visitors to the Valley. Demand for inexpensive accommodations had far outstripped the numbers she could accommodate in the available space she had. The Sierra Club finally agreed to moving the building to a site a short distance west of the original location. Gutleben Brothers Construction Company, hired to move the building, dismantled the roof structure and as much of the original stonework as they could. Their German stonemason and a few other workers rebuilt the lodge according to the original plans on the new site. The building reopened during the summer of 1919. New doors were added to the wings in 1921, and shelves were constructed for storage in one of the side rooms that same year. In recent years, new lights were suspended from the roof beams. The Boston Ivy which grew on the stone masonry was either removed or died over the years. LeConte Memorial Lodge is a highly unusual structure for a national park setting. Its Tudor revival architecture and strong European tendencies are found in no other building in the National Park System. John White, the architect of the building, was greatly influenced by the work of his brother-in-law, Bernard Maybeck. Both believed that a building's s site and choice of construction materials had a strong influence on the building's design. To them, buildings were designed to be a part of the landscape in which they were constructed. The emphasis on verticality in LeConte Memorial Lodge, for instance, reflected the steep pitches of the cliffs surrounding Yosemite Valley. Also, White and Maybeck both believed that the architectural design of a building was determined by the materials of which it was built. If a building were to be constructed of stone, for instance, the building should look like a substantial stone structure. If the roof structure were wood, the natural materials should be exposed on the interior. To them, architectural interest was derived not from decorative detail, but from exposed structure. Whatever was of structural importance became the feature of ornament. White, Maybeck, and others of the Bay Area school also agreed with English critic and aesthetician John Ruskin s interpretation of architecture as frozen music. The repetition of architectural elements--such as the engaged piers, hammer beams, and scissors trusses--were like the rhythm in music or meter in poetry. White's LeConte Lodge is a unique building for a national park: it is a transitional structure of strong European roots combined with the revolutionary way that Bay Area environmental designers used building materials. The building is of regional significance in the area of conservation as the principal foothold of the Sierra Club in the mountains from which they took their name. The Sierra Club was first conceived as an informal mountaineering club for people connected with the University of California, Stanford University, and other interested parties who wanted to explore the Sierra Nevada and mountainous regions of the world. When the Sierra Club was formally chartered in 1892, its directors discussed locating Club headquarters in Yosemite Valley. They finally decided on a San Francisco headquarters, but were allowed by the California State Commission to establish a public reading room and information center in Yosemite Valley where people could get information on the mountains-- how to reach them, flora and fauna, etc. They set up headquarters in a small wood frame cottage in the Yosemite Valley in 1898. Following the death of charter member Joseph LeConte--noted geologist, original member of the University of California faculty, and sponsor of Sierra club outings to the Yosemite region--the Club decided to build a structure in his memory. 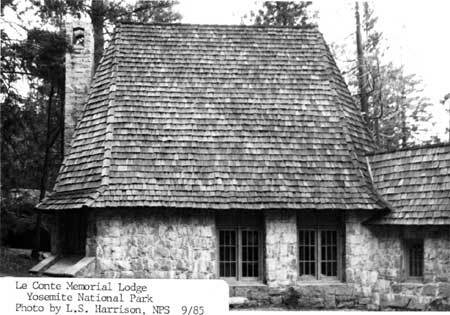 LeConte Memorial Lodge was constructed with contributions raised from the faculty and staff and the University of California and Stanford University. Architect John White donated his services. The building was moved in 1919, as noted in Section 7. In both locations it functioned as the location of the Sierra Club's LeConte Memorial lectures and other naturalist activities preceding the development of National Park Service programs. It also served as the place where the Sierra Club disseminated information to the public and garnered support for their conservationist activities. Part of the Sierra Club Library was placed in the building. The building is still used as a meeting place for programs sponsored both by the National Park Service and the Sierra Club. The Sierra Club still maintains the mountain library and club information bureau for use by park visitors. 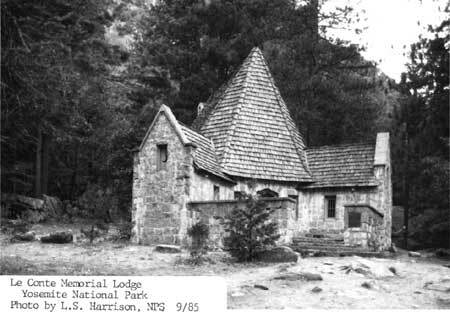 Adams, Ansel, "LeConte and Parsons Memorial Lodges," Sierra Club Bulletin, Volume XI, Number 2 (January, 1921). Adams, Ansel, "LeConte Memorial Lodge -- Season 1921," Sierra Club Bulletin, Volume XI, Number 3. Phil Gutleben to Superintendent John C. Preston, Yosemite National Park, June 12, 1964, from Yosemite National Park Research Library. "Reports of Committees," Sierra Club Bulletin, Volume XII, Number 4 (1927). "Secretary's Report," Sierra Club Bulletin, Volume V, Number 2. Sierra Club Bulletin, Volume V, Number 1 (January, 1904). Sierra Club Bulletin, Volume XI, Number 1 (January, 1920). The boundary is shown as the dotted line on the enclosed map (omitted from on-line edition).